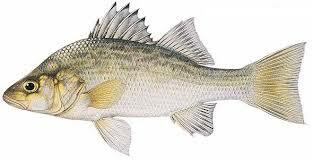 ​White perch are native to Atlantic coastal region of the United States and invaded the Great Lakes through the Erie and Welland Canals. ​The yellow perch is native to ​much of North America including the Great Lakes. The round goby appeared in the St. Clair River in 1990 and spread to all of the Great Lakes by 1994. The goldfish is a domesticated carp, first bred in ancient China for ornamental gardens. For centuries, goldfish were prized symbols of luck and fortune. Shortly after they made their way to the United States in the mid-1800s, however, they transitioned from the exotic to the mundane. Freed from the constraints of a tank, goldfish balloon to the size of footballs. Within a few generations, they revert to natural yellow and brown colors, in place of bright orange that breeders try to achieve. There are three species of Asian carp that are considered invasive and a threat to the Great Lakes: the bighead, silver and black carp. Silver and bighead carp are filter-feeding fish and consume plant and animal plankton. Asian carp can grow to large sizes: some as large as 110 pounds, though the average size is around 30-40 pounds. Bighead and silver carp are voracious eaters, capable of eating 5-20 percent of their body weight each day. The Largemouth Bass is one of the most popular gamefish in Michigan. In Michigan, Largemouth Bass are seldom found deeper than 20 feet. They prefer clear waters with no noticeable current and do not tolerate excessive turbidity and siltation. In winter they dwell on or near the lake bottom, but stay fairly active throughout the year. The Hybrid Bluegill is a cross between a Male Bluegill and a Female Green Sunfish, and is sometimes referred to as a Hybrid Sunfish. Popular sport fish and important food source for Bass.